No parade. No speeches. No wildly cheering crowd. This is not the coronation of a king or the inauguration of a president. This is a dedication of a high priest and his assistants. In these three long chapters we will read how Moses inaugurated his brother Aaron and sons as priests in the newly completed Tabernacle. First the necessary sacrifices are detailed. Then Moses assembles his brother and nephews, washes them, gives them their special clothes, and performs the ceremony. He assembles the people at the door of the Tent to witness this event. He applies holy oil to the furniture of the Tabernacle, sprinkles that oil seven times on the altar, and anoints the head of Aaron as High Priest. He then brings in Aaron’s sons and dresses them. Then come the sacrifices. A bullock and two rams, each has special significance. The bullock is a sin offering. The first ram is “olah” – literally a burnt offering, but the word also means “rising,” directing human thoughts upward, rising to heaven with the smoke. And the second ram is “millu-im” – completion. During this whole ceremony, we might find it surprising that Aaron and his sons do not lead it. All they do is place their hands on the head of the sacrificial animal before it is slaughtered. Moses does all the work. Only when the rites are completed does he give his nephews instructions about cooking the meat and where to eat it. They will stay in the Tabernacle for a full week, and work into their duties. This ceremony consecrated the hereditary priesthood – the cohanim —for all of Jewish history to come. So we will read the account of slaughtering animals, and which parts were burned, which parts eaten, and how the blood was used to sanctify the priests – a drop on the right ear-lobe, a drop on the right thumb, a drop on the right big toe. Quite graphic. Obviously this is not how we practice our religion today. After the Temple was destroyed, the rabbis set a principle: Prayer replaces sacrifice –t’filah bim’kom korban. They created a prayerbook that includes descriptions of the ancient sacrifices, and taught that repeating those descriptions qualifies us as if we performed the sacrifices ourselves. Some Jews still anticipate building the Third Temple and restoring the sacrificial cult. Others deny that plan, consider it barbaric. And many realistic traditionalists, even though continuing to read about the sacrifices in the daily prayers, will simply wait for the Messiah and let him decide what rites to perform in the Third Temple. Yet when we read the Torah in the synagogue, we continue reviewing the sacrificial offerings every year, in this portion and indeed in a large part of the Book of Leviticus. Why? What we should take note of here are the reasons cited for sacrifice. They include violations of positive commandments, and of prohibitions. Those call for what the Torah defines as Sin offerings and Guilt offerings. Other reasons for sacrifice are even more contemporary: thanksgiving, and peace. The very Hebrew word for a sacrifice, korban, comes from the same 3-letter root as the word karov – “near.” Through the ages, our sages stress that point. In Hasidus, to be m’korev someone is not to sacrifice them but to bring them near, to involve them in Jewish life. Our sacrifice may not be expressed in slaughtered cattle, or in cornmeal flavored with frankincense. Instead, we offer our time, our labor, our cash. A selfless act of devotion can bring us near to G-d and to each other. Sharing our food with the hungry, helping those who have no help, teaching those who need to learn, and joining in prayer with any 9 Jews who need one more for a Minyan – are just a few ways we can fulfill the Mitzvah of sacrifice today. We don’t even need holy oil. 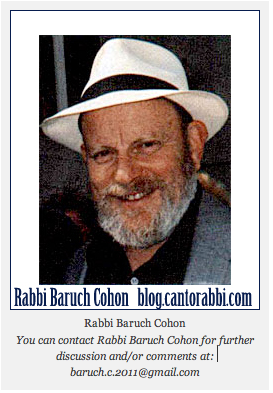 This entry was posted in Jewish Blogs and tagged Aaron, Blog, Cohanim, dedication, High Priest, Holy Oil, Inauguration Day, karov, korban, Leviticus, m'korev, Minyan, Moses, Priestly Blessings, Rabbi Baruch Cohon, Rabbi Samuel S. Cohon, rabbis, Sacrifice, t'filah binkom korban, Tabernacle, Torah Blogs, Torah interpretation, Torah Study, Tzav, zot torat ha-olah h ha-olah. Bookmark the permalink.